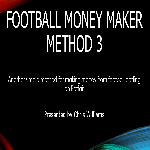 Football Money Maker Method 2 is the second in Chris Williams' highly-successful series of betting methods that makes it easy to profit from football betting on Betfair. 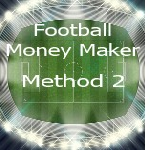 Football Money Maker Method 1 is a new betting system from renowned betting specialist Chris Williams that makes it very easy to make money betting on football matches on Betfair. The method is very ease to use & has a track record of profitability.